Q. How did the KLF research grant facilitate your research process? MJ: I used the grant for research towards my on-going photo project Independence Day 1934-1975. It was very valuable to receive support from the KLF because its an on-going project, begun in 2009 and most grants are not set up to support on-going art projects. Depending on the kind of research, artistic research, similar to academic or scientific research, can unfold in stages and over time. Independence Day 1934-1975 consists of archival photographs, mainly from the first days of independence of various Asian, Middle Eastern, and African countries. A key concept of the work is the archival origin of the images, more often than not national archives located in the countries themselves. The KLF grant was used specifically to continue my research on Independence Day photos in Asian and African archives. Q. How did the 'versions' system of the KLF Project help in the documentation of your research process? MJ: The 'versions' system was helpful because it allowed me to make aspects of my research available online to the public, but without the pressure of presenting material, which forms a coherent artwork. The KLF project website provides another space and time to communicate with an audience, outside formal exhibition parameters. Often during the research process one uncovers interesting side stories or angles, which although do not make it into the final artwork, still shed light on the themes explored in the project. Furthermore the 'versions' system allows one to share information as it arises even before the final work materializes. Thus it introduces another space and time into art making and communication. Q. Were your research materials curatorially present for people to see? Why so/not? MJ: The final work was the photo installation Independence Day 1934-1975. Some of the research materials were also displayed in the space because this was part of the concept of the show. Furthermore Betonsalon is the only art center located in a university context (Paris VII) in France and it has long been involved with exhibiting research-based art practices. I also presented some of my research in the exhibition space in specially built wooden display modules. The elements presented included certain photos, articles or texts that inspired me or that I discovered during the course of my research, similar to what was seen online on the KLF project page. Q. Can you tell us more about the exhibition that was born out of your research? 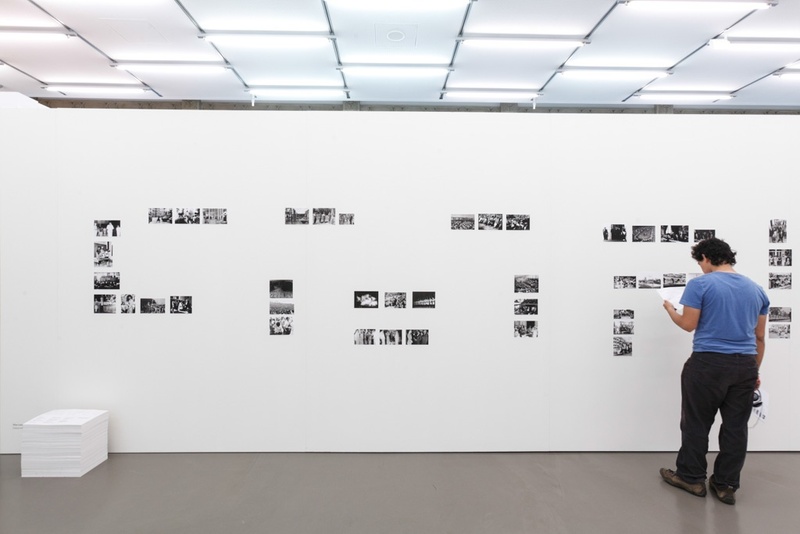 Maryam Jafri, Independence Day 1934-1975, 2009-present, installation view, Communitas, Camera Austria 2011. Courtesy of the artist. MJ: The research was presented in a solo exhibition at The Day After at Betonsalon, Paris (March 17-July 11, 2015). In its current iteration at Betonsalon, Independence Day 1934-1975 shows sixty images from twenty-nine archives. When Melanie Bouteloup, the director of Betonsalon, approached me to show the work in Paris, she asked if I was interested in giving the research behind the work, a visible form within the exhibition space. Hence along with the wall-based photo series, I have also conceived, in dialogue with Betonsalon and designer Hadrien Gerenton, an architectural display system made up of various research modules that offer different views into the process and ideas related to Independence Day 1934-1975. 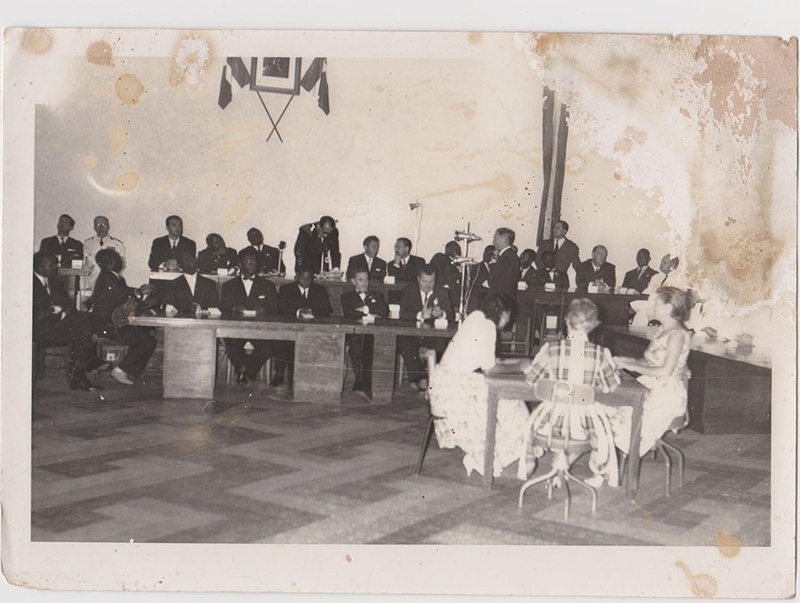 For example, some modules contain personal contributions by historians and others who helped me in my research, such as Helihanta Rajaonarison, a historian from Madagascar, and Franck Ogou, archives manager at École du Patromoine Africain in Benin. Still, others contain fictional materials that inspired me in different ways, such as my personal copy of Jean Genet's play The Screens about the Algerian War and Sadat Hasan Manto's famed short story about the 1947 partition of India and Pakistan, Toba Tek Singh. There are also some modules in the space, which are the result of workshops with students who responded, or in some way related to the themes of Independence Day 1934-1975. Since Betonsalon is located on the campus of University Paris Diderot, collaborations with students and scholars form an important aspect of its programme. Q. What, in your opinion, is the value of documenting and archiving artists' research? What more can be done to encourage looking at /treating research as practice? MJ: Documenting and archiving artists' research allows the audience to better understand the nature of artistic labour. Too many people are still wedded to romantic notions of the artist and fail to understand that artistic labour can be as rigorous and demanding as other forms of knowledge production, such as scientific research. At the same time, institutional funding structures are generally not set up to prioritize or even recognize the concept of an 'on-going' art work. Too many people expect clear start and finish dates, and though I think it is important that the public has access to an on-going project in its various iterations (for example in shows where unfinished, process-based or on-going work can be shown), there is still too much emphasis on the 'new' and the 'latest.' This needs to change. Maryam Jafri is an artist working in video, performance and photography. Informed by a research based, interdisciplinary process, her artworks are often marked by a visual language poised between film and theater and a series of narrative experiments oscillating between script and document, fragment and whole. She holds a BA in English & American Literature from Brown University, an MA from NYU/Tisch School of The Arts and is a graduate of the Whitney Museum Independent Study Program.She lives and works in New York and Copenhagen.